In How Economics Professors Can Stop Failing Us: The Discipline at a Crossroads, Steven Payson offers a US-focused critique of the professional practice of teaching and researching economics today, covering areas such as publishing, hiring, and promotion. As readers will likely find themselves nodding in recognition at many of the issues identified by Payson, Christopher May finds this a welcome voice contributing to the growing call to transform the study of economics. 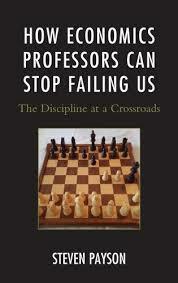 How Economics Professors Can Stop Failing Us: The Discipline at a Crossroads. Steven Payson. Lexington Books. 2017. The academic discipline of economics has been subject to a growing level of criticism, from both within and outside the academy. Often led by students, the criticisms of economists and their ideas are myriad and frequently related to their perceived position as handmaidens to neoliberalism. In the UK, groups such as Post-Crash Economics or Rethinking Economics have been launched by students dissatisfied with the mainstream teaching of economics, with The Econocracy often presented as their manifesto. Reflecting this appetite to see economics done differently, my own course “Economics for the Real World” (an undergraduate political economy course offering an alternative view to that taught in the economics department at my university) saw its enrolment double in 2017, its second year. This climate of dissatisfaction with and criticism of the mainstream has generated a wide range of commentary and books, to which we can now add Steven Payson’s intervention. How Economics Professors Can Stop Failing Us: The Discipline at a Crossroads, however, is rather differently conceived from many of these other critiques and complaints, which for the most part focus on economics as theory. By contrast, Payson self-avowedly seeks to “call out” professors of economics for “their overall lack of ethics, integrity, and responsible leadership” (xi, emphasis in original). This is to say, the book is often a critique of professional practice, although Payson is far from uncritical of economics itself. Indeed, early on, he argues that what distinguishes economics professors from similarly senior colleagues in other disciplines is that the faults Payson identifies are reinforced by the very discipline in which they work: there is a vicious circle operating that links economic analysis of “rational” actions and the behaviour of economics professors (and, by extension, their less senior colleagues). Payson mounts a number of withering critiques of the work of (mostly North American) professors of economics. He suggests that much theoretical work is perceived by its authors as being as strong as its strongest analytical link, when really it is as weak as the weakest simplifying assumption deployed (and some are pretty weak and unconvincing). Unsurprisingly, he also is critical of Milton Friedman’s famous (and still influential) position that economics’ assumptions don’t matter (however odd/false they might appear) if the predictions that result have some salience. Likewise, Payson is highly critical of neologisms and new “technical” concepts, all of which he regards as representing more of a rite of passage for economics graduate students to struggle through than offering any real social benefit for those seeking to understand the economy and its workings, not least of all as few people outside the discipline read much of this analysis (so-called). More generally, he mounts a detailed critical analysis of the process of publishing in economics, which includes a rather wry set of tables comparing what authors say in articles intended for publication in the American Economic Review with what they really mean, which at times verges on (but doesn’t quite become) a parody of academic discourse. Mostly, it’s all meaningless and unread, serving merely as fodder for the discipline itself. 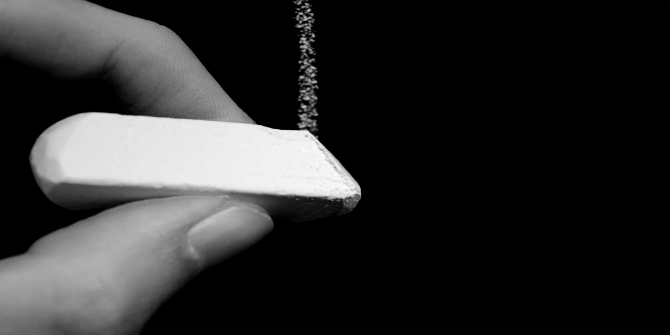 Image credit: Blackboard by Franz Kohler. This work is licensed under a CC BY-SA 2.0 license. As this might suggest, for Payson the behaviour of professors of economics is driven by the perverse incentives for publication as well as the self-reinforcing value system behind the recognition of important work and its role in the hiring and promotion practices of the major economics departments in the USA. This leads to an extended examination of the use and abuse of citation counts/data, both for journals and for academic authors, which he regards as a quasi-technical crutch behind which judgments are hidden in hiring committees; indeed, as he notes, given such committees often include editors of and reviewers for “top” economics journals, they are effectively forcing their particular prejudices onto the next generations of scholars. Likely much more evident in the USA, but hardly absent elsewhere, is how the normative commitments of economists in relation to markets have led to one insidious prejudice in particular: a fondness for demonising and downplaying any positive role for the state in economic growth and development. Here, he seems to be arguing (although it is not quite made explicit) that the demand that economics should not be corrupted by politics is, in fact, violated by the manner in which professors’ own political assumptions are rendered as technical results of analysis. Payson also criticises the claim made by experimental economists that they are really conducting a science of economics: he argues that the subjects of the experiments are engaged in a set of practices so abstracted from the real world to render any results extremely doubtful, not least of all as the experiments themselves seem to incentivise specific forms of response (in other words, there is a lack of social reflexivity). Finally, Payson moves on to actual bad behaviour; here, while he might be right about the specific motivations driving ethical lapses in economics, much of what he criticises seems to me to represent and reveal a much wider set of problems than are just to be found in economics departments. Sadly, there are always too many violations of professional ethics, although Payson would likely argue it is worse in economics. Overall, this is a highly personal book, which is in no way meant as a criticism: indeed, the entire text might be read as an implied criticism of the passive-voiced, (pretended) “science” of economics. Payson builds on and develops a range of disparate criticism, some of which I was aware of; some of it not so much. His valuable work is bringing this all together before focusing on the actual agents (the professors) who (re)produce these problems for the profession of economics. At times, the book does nonetheless lapse into a scattergun of criticism, flitting from one topic to another, sometimes without an obvious central argumentative dynamic or considered direction. In the end, then, this book may be best read in bits, utilising the index to pick those things that most annoy you about your local economics department so as to arm yourself with Payson’s withering criticisms. That the book is focused almost entirely on North American professors should not be taken as indication that all is well on this side of the Atlantic. If, like me, you work in a university with a large (and strident) economics department, but are not of that department, you will find much here to make you smile and frown in recognition. It is clear that it is time to change economics, and Payson is yet one more voice that (hopefully) will make such change inevitable. Christopher May is Professor of Political Economy at Lancaster University, UK. His most recent book is Global Corporations in Global Governance (Routledge 2015) and he is currently editing The Edward Elgar Research Handbook on The Rule of Law (2017). He has published widely on the interaction between law and political economy, and wrote the first independently authored study of the World Intellectual Property Organisation.